Upon finding this photograph, I realized it was a good time to once again post my reminder about all the retro/vintage/Americana material on this website. While I cannot help loving all of the designs and advertisements used in the heart of the 20th century, there is a dark side to them even when not as obvious as what is seen above. Even though I avoid the most blatant old ads with terrible caricatures of non-whites, it should not be forgotten that many of the old businesses I post did not welcome people of color (or, as shown above, forced them to use separate accommodations). Even in ads that seem harmless, the complete exclusion of "normal" blacks, Hispanics, Asians, Native Americans, etc. outside of race-specific publications such as Ebony and Jet was thoughtless at best and selfish at worst for those that feared losing business by seeming to cater to minorities. This is why I always say I enjoy visiting the past but would not want to live in it. It is also why in my other major online endeavor, KoHoSo Radio 66, I try very hard to right the wrongs of the past and present all artists equally with special highlights on the black forefathers and mothers of rock & roll that did not get their due once Elvis Presley fully kicked down the radio studio door of segregation. It’s because of the picture above that I think all should be open about how things were. After all, we have a big portion of Americans that don’t have happy memories or have heard great stories about traveling the country. While people like me were welcome everywhere, others had to deal with lower-grade facilities if any were offered at all, "sundown towns," and worse. It is only though that type of honest conversation that we can get over the hump of minorities feeling uncomfortable with "retro tourism" and then encourage them to become more a part of it in presenting their own stories through museums, displays, and businesses…and not in a way to shame "whitey" but, instead, so we can all move forward together once we confront the truth. After all, the truth shall set you free…and I don’t think there’s anybody reading this that does not want to fully live those famous words, "Free at last." 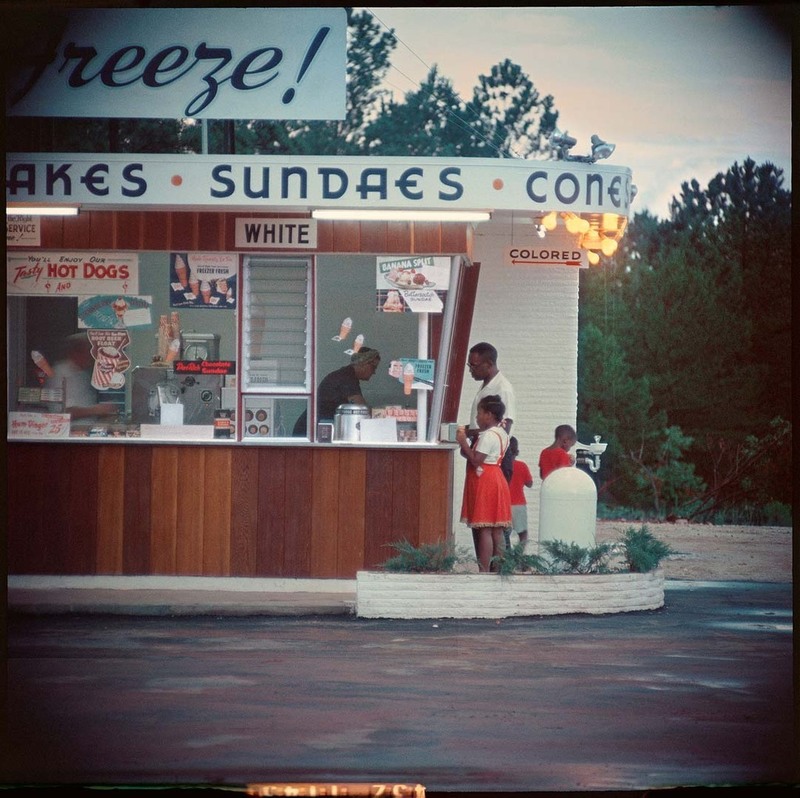 Posted in 1950s, History, Retro/VintageTagged Americana, bigotry, ice cream, Jim Crow, photography, racism, restaurantBookmark the permalink.